All preLink® connectors, sockets, and the new PCB sockets have one thing in common: they can all be connected in seconds using the preLink termination block. The coherent heart of the system. A unique functional feature of the preLink® system, not available elsewhere on the market, is the separation of cable and connector into two separate units. The cable and connector previously had an attached, permanent connection. Previously, crimp contacts or insulation displacement contacts could be connected only once. Now, the preLink is divided into two separable units. 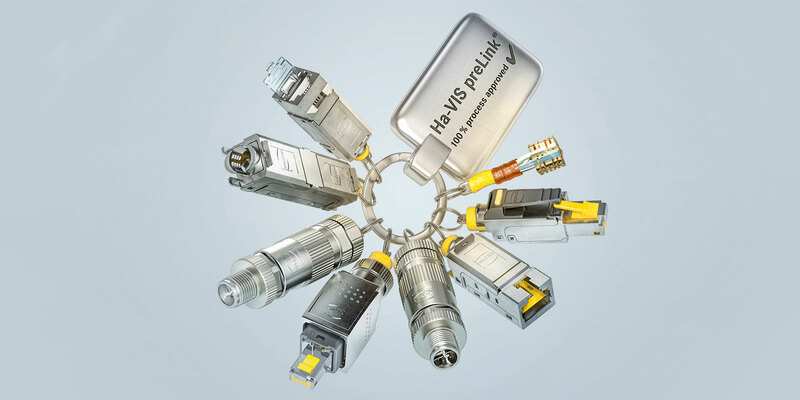 The first unit consists of connectors, sockets, couplings, or PCB terminals that have an identical fixture for holding the preLink termination block. This termination block is the second unit and the virtual heart of the system. It can accommodate up to eight stranded or solid wires, which can be simultaneously shortened and connected in one step using the corresponding pliers. The cable, which can be assembled on-site in a completely reliable process, now fits in every preLink component and can be inserted, removed or replaced at any time. This means that cables and connectors can be replaced independently of each other or installed separately as needed. This is particularly helpful if you can implement the cabling using ready-made cables. The data cables with the connected preLink® termination block also fit through tight spaces and can be connected in seconds after they are routed. That makes the task much easier and saves time. In addition, worn cables used with moving devices can be changed quickly and independently from the connector; this further reduces operating costs. The important benefit is the absolute process reliability of the installation. The system is error resistant and its unchanging installation process delivers continuous high performance and long-term stability. This is guaranteed by the exact match between the preLink® assembly tool and preLink® termination blocks. A big advantage of this technique is the relative assembly ease when compared to crimping and IDC. The wire strands are threaded only once through the marked openings in the termination block. They are then shortened and connected in one step using the corresponding tool. The insertion into the connector is so easy that even unskilled personnel can carry out the cabling work safely and reliably after brief training.